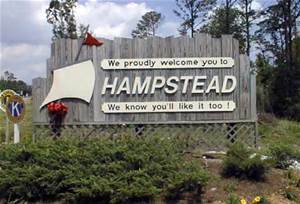 Hampstead is a beautiful, laid back city, packed with an abundance of outdoor recreation located in between Jacksonville and Wilmington. This growing area, 15 minutes from North Wilmington, now has enough restaurants and retail opportunities to entice you to stay. From Hampstead, you can be beach side in Surf City or Topsail Island in a matter of minutes. You are only a 30 minute drive to Wrightsville Beach. The Hampstead area is also home to the highly sought schools of North Topsail Elementary, South Topsail Elementary, Topsail Elementary, Topsail Middle School and one high school, Topsail High School, which is located right next to Topsail Middle and within walking distance of the Hampstead Branch Library. Each year in the fall on the last weekend in September, Hampstead holds the North Carolina Spot Festival. Thousands of local residents and visitors attend this annual event to dine on “Spot” dinner plates. This festival is the largest fundraiser for Topsail schools and the Hampstead community.